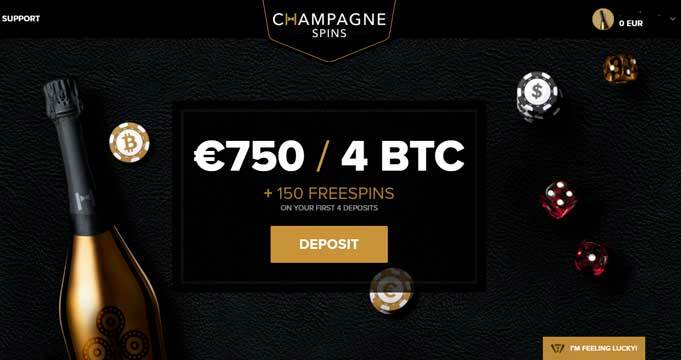 Champagne Spins is a brand new bitcoin casino launched in March 2018. It is an advanced gaming portal where you can try your luck with real money or in demo mode. Great games, amazing generous promotions, gifts and excellent service you can only dream about – all this awaits you at Champagne Spins Casino. Champagne will certainly attract your attention. This sparkling wine “knows” how to entertain and where to find real treasures! Champagne Spins Casino is fully licensed by Curacao Government. The registration process is simple and fast. Just click on SIGN UP button in upper right corner of the website and fill out the registration form. You will be required to specify Email, Password, Currency and Bonus Code if any available. Do not forget to enter your valid email address, since you will need to verify your account clicking the link which you will get via email. Champaign Spins Casino can boast great game collection which consists of over 1000 titles. All casino games are divided into following categories: Top games, All Games, Slots, Jackpot, Table Games, Live Dealers, Other. We recommend you to take a look at Jackpot games and take your pick. Try your luck playing these high rewarded slots and probably Lady Luck will smile on you. The most popular slots are A Night in Paris JP, At The Copa, Glam Life by Betsoft Gaming, Mega Moolah, Tunzamunni and Treasure Nile by Microgaming. If you fan of land-based casinos, you can visit the live dealer casino section, which offers baccarat, poker, and blackjack. High Roller Bonus 75% up to C$3800 + a bottle of champaign Moët & Chandon Brut Premier. Minimum deposit C$1500 or 1 BTC. Mondays bonus at ChampagneSpins. Deposit C$45 or 3mBTC and you’ll receive 20 free spins on your favourite game! This offer is available for all players every Monday! Thursday Reload bonus. Get a 50% reload bonus, up to C$150 or 1BTC for each deposit! Champagne Spins Casino provides a vast selection of payment methods fee-free. The minimum deposit is C$30, 0.0025 BTC. 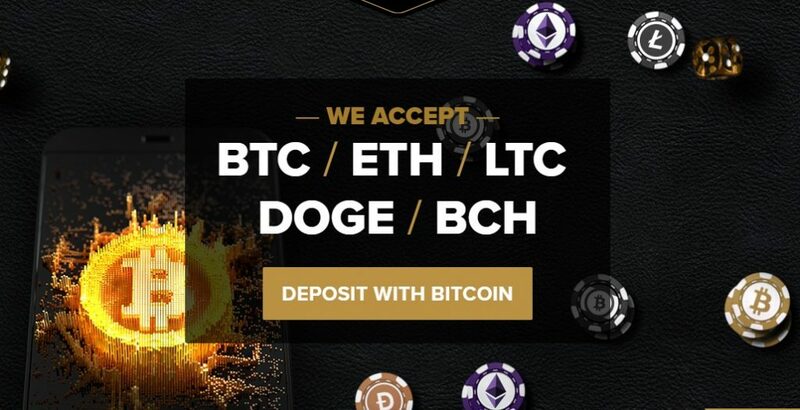 Casino accept and process EUR, USD, BTC, CAD, ZAR, PLN, RUB, AUD, NOK, Litecoin, Bitcash, Dogecoin, Ethereum. Fiat currency, Litecoin and Dogecoin will be equivalent to Euro deposits and conditions, while Bitcash and Ethereum will be equivalent to Bitcoin values. You can fund your account using Visa, Mastercard, Bitcoin, Skrill, Paysafe card, Neteller, IDebit, Instadebit, Bitcoin Cash, Ethereum, Litecoin, Dogecoin. Canadian players are welcome to play at Champaign Spins casino. If you are a player from Spain, France, Israel, Serbia, the United Kingdom, the Netherlands or the United States, or you are in the territory of one of these countries, you won’t be allowed to play fiat money wagering games including Bitcoin. Apart from this, you can contact them via Live Chat. Champagne Spins Casino has a Curacao license and promotes fair, safe and responsible gaming. You can play using Demo version to familiarize yourself with basic rules and improve your skills. You can start playing for real money at any time: just go to your personal account and choose which payment system you prefer. Champagne Spins Casino protects its players by using money protection as SSL 3.0 protocols, transferring all data to an official processing center to maximize security. Players can add 2FA to make their accounts even more secure. Champagne Spins invites you to dive into the exciting world of the gambling with a wide selection of games for all tastes, regular promotions and tournaments , the best and most reliable payment systems, excellent customer support and unforgettable experiences! You can play with Canadian dollars, Bitcoin, Bitcoin Cash, Ethereum, Litecoin and Dogecoin. Expand your gaming capabilities by using outstanding service from Champaign Spins Casino.